Bluetooth Car Kit for AUDI, VW, MB - Music Interface Adaptor for in car iPod Integration AMI/MDI/MMI [CAR005978] : Onchee.com - the accessory shop for all your handheld Electronics! This Plug-And-Play wireless Bluetooth adapter allows you to add Bluetooth music integration into your vehicle without factory Bluetooth connectivity. This adapter plugs into the factory-existing dock connection. This connector is found on models that come from the factory with AMI (Audi Music Interface), MDI (VW Media-In Multimedia Port), and MMI (Mercedes Media Interface) ports. 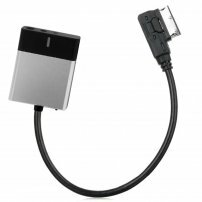 Instead of manually plugging the iPod into the cable connected to the media sockect every time you enter the car, you instead connect the this kit with integrated cable to the original media socket which you would have normally connected your OEM iPod lead to. This kit is then left in the car permanently connected to the original socket. Once the kit is connected to your car and paired with your device, every time you re-enter the vehicle the Bluetooth connection will be established automatically, meaning that your full music library will be instantly accessible on your in-car iPod interface, without having to remove the phone from your bag/pocket and manually plugging into the cable. This allows for a much more enjoyable in-car music experience as you can simply get in and drive, without the risk of leaving the device in the car after the journey. This kit offers a complete level of integration designed to replicate the results of physically connecting your device to the existing AMI/MDI/MMI dock connector in the car. If your current iPod/iPhone setup shows track, album, playlist and album artwork info on the cars original screen then all this information can still be viewed on screen using this kit. This kit retains all of the cars original controls, so you can continue to use the dashboard and steering wheel controls present in your car to operate the iPhone/iPod in the same way as if it was physically connected. - Bluetooth Media Streaming for Audi, VW and Mercedes Benz from any phone. Android support for music streaming.